So you have had your training with Buttercream & Bows Cake Decorating Academy and you can confidently decorate your cakes and cupcakes, and you have attended the Cake Boss Class (http://www.buttercreamandbows.co.uk/classes-2/ ) and learnt how to successfully plan and start your very own cake business. Now ,you will have a web site or Face Book page ,as a web presence will be your shop window to start with no doubt as you will be working from home initially. You can use this article to plan very stylish and on trend wedding or other celebration sweet or dessert table . Sweet tables are that lavish touch to any party. Beautiful sweet table styling never fails to wow party guests. 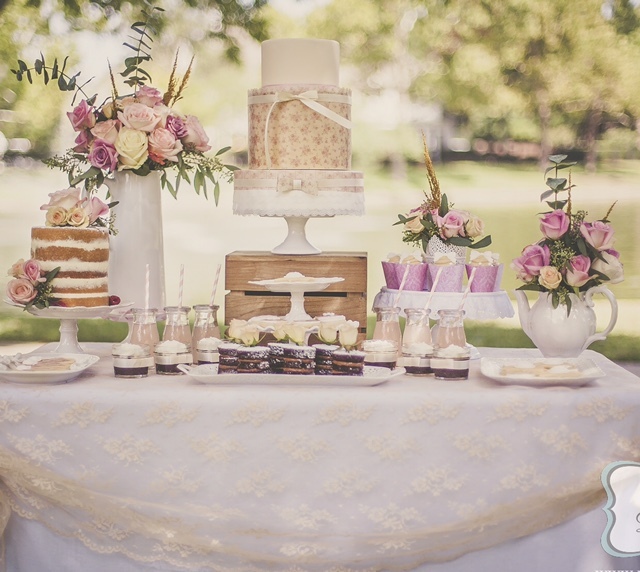 At a Wedding Cake Consultation you should be offering extras such as a Sweet Table. Don’t run before you can walk though ,but this must be on your project plan to offer. So setting up a photo shoot or preparing a Sweet Table – Its both the same. Exquisite sweet table encompassing all the elements of dessert table cab be easily achieved. Complementary styled cakes, vintage decorated cookies, elegant cake stands and old style apothecary jars, fabulous florals, pretty hanging decorations, beautiful presentation and perfect symmetry make your display or photo an excellent shop window for you. There are a number of essential elements for a perfect sweet table. Sweet table styling is all about tying together those essential elements under your chosen theme or colour scheme. To get you started in sweet table styling, here is our guide. Your starting point is always going to be the colour scheme and or theme for your photoshoot or the event. You can choose a palette of two or three colours. For instance, if using white serving dishes then white will Always be your third colour, so just chose two other colours. The next step is designing your centrepiece, which is almost always a tiered cake, but it doesn’t have to be. It can just as easily be a single-tier cake with a wow topper on a pretty pedestal cake stand, or it can even be a beautiful floral arrangement. Next, look at what props are available to you in your chosen theme. For instance, for a travel theme you could use a globe as a prop, with vintage suitcases stacked under the sweet table. Look in charity shops or jumble sales for old things and mock them up. We are talking a couple of pound here ! Or Hire it …we have contacts ! 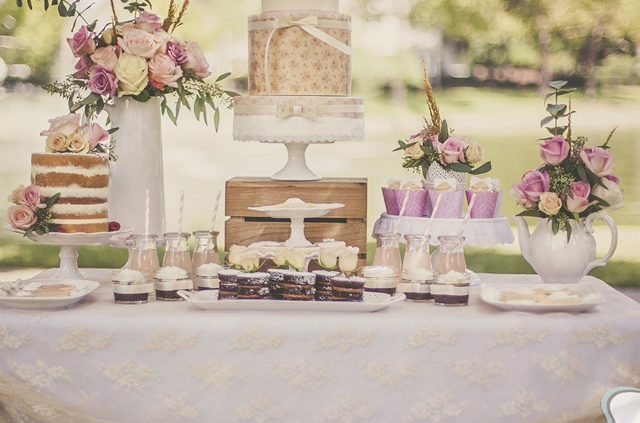 Pearls and Lace (formerly The Cute Cupcake Company) are a fabulous example of fantastic sweet table styling with their superb vintage sweet table below, including fabulous use of vintage props – a vintage birdcage, hatboxes, strings of pearls and cupcakes in pretty china cups. Take their ideas but don’t copy it won’t make you look good ! More ideas to come …. Naming Your Business Using Props for your Dessert Table and Photo Shoot .